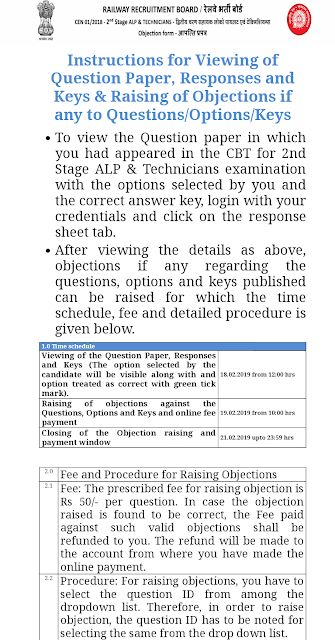 Railway Recruitment Board has released ALP/Technicians 2nd Stage CBT Answer Key. The Answer Key will be available from 18th February 2019 12:00 PM to 21st February 2019 11:59 PM. 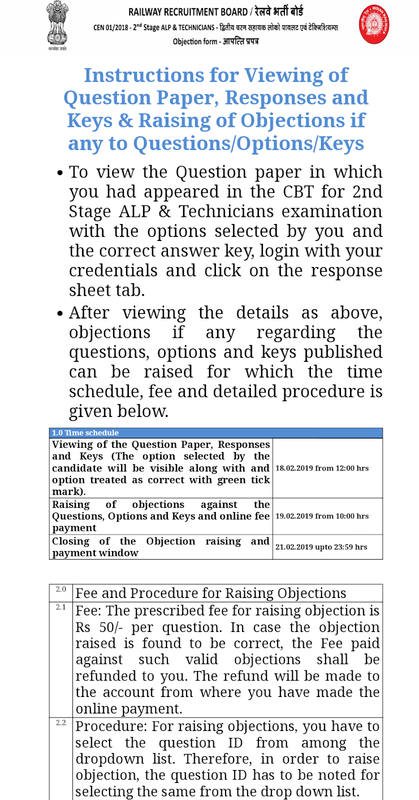 Candidates can download answer key and raise objection against answer key from given link. Fee: The prescribed fee for raising objection is Rs 50/- per question. In case the objection raised is found to be correct, the Fee paid against such valid objections shall be refunded to you. The refund will be made to the account from where you have made the online payment. Procedure: For raising objections, you have to select the question ID from among the dropdown list. Therefore, in order to raise objection, the question ID has to be noted for selecting the same from the drop down list.